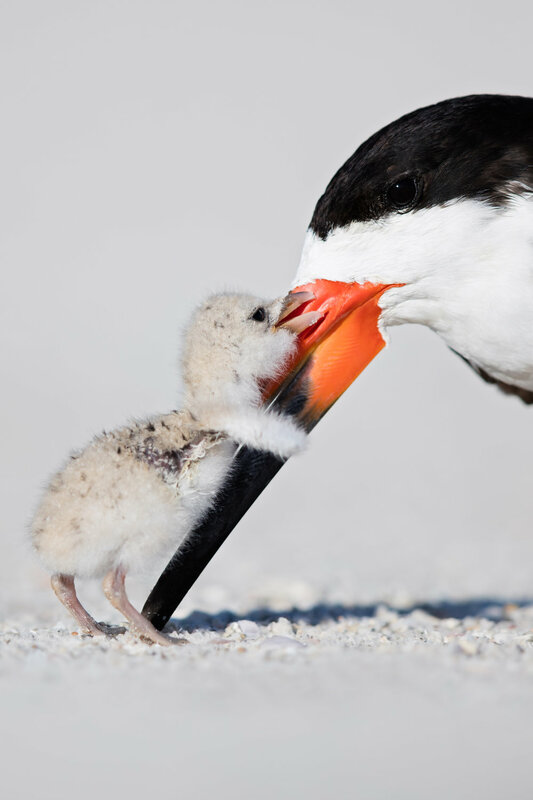 Located on Floridas white sand beaches, surrounded by blue vibrant water, lies the best location in the world to view and photograph Black Skimmers nesting with babies. Situated on some of the prettiest beaches in America, this location provides photographers with an unmatched clean foreground and background of white sand. Nowhere else in the world features the combination of unprecedented access allowing for a small working distance between you and the Black Skimmers as well as a lesser known photography location allowing exclusive access with little to no other photographers around. Spending time with the Black Skimmers in Florida will leave you with a lifetime of memories. Unlike other locations that forbid you from getting close, our carefully scouted location allows for close working distances. As we crawl on the sand close to the colony the Black Skimmers they will be comfortable with you allowing for natural interactions photos between the parents and the chicks. Because the chicks need to be fed, other images like skimming photos and flight shots are easily captured next to the colony even during golden hours. We are the sole tour operator that runs an unmatched Black Skimmer photography tour and provide our clients with the opportunity to photograph natural behavior. We will always pay attention and respect the Black Skimmers making sure our presence does not impact them in any way. Because there are many chicks, you will have many opportunities to capture interaction photos that you will want to hang on your wall. We are not going to lie to you. This Black Skimmer tour is on a Florida beach in the summer; the weather can be unforgiving with hot and humid days, or even afternoon thunderstorms. You will also be lying on the ground for hours next to the Black Skimmer colony, which might be hard for some people. On the plus side, the Black Skimmers are on the beach where a nice breeze normally is a relief to a hot summer day. Join us on a trip of a lifetime to photograph Black Skimmers with a guide, Thomas, who is a Florida local and has years observing Black Skimmer behavior. Our itinerary maximizes your time in the field and makes sure you get the experience and photographs of your dreams. Before the sun rises, we will leave the hotel around 5:50AM to ensure an early arrival. We will have three full days in the field to focus on Black Skimmers & their chicks. With a total field time of three and a half days this increases you liklihood of days with favorable weather. After the morning session, we will have a midday break from 10:30AM-4:00PM for lunch and also to ensure the saftey of the Black Skimmers during a vulnerable time in the day where eggs can overheat. After photographing during sunrise and ariving back to the hotel around 10:40AM, there is optional Adobe Lightroom and Photoshop classes offered.